Lead generation components and user-experience go hand-in-hand if the principles of inbound are at the core of your marketing initiatives. That’s because your prospects will only respond to your lead generation call-outs when they get a valuable experience on all your digital assets and the various components inside it. The blog becomes the most obvious asset for your business to engage visitors with valuable information. Along with the layout and the content of the blog, you need to ensure that your calls-to-action to qualify the visitors in the next step of the buyer’s journey shouldn’t disturb the overall user experience and also serve the purpose of achieving your business goal. Lead generation components have been evolving rapidly just like any other channel in the online marketing sphere. They are giving clear clues to the prospects in the most attractive manner. Customers are well-versed with all aspects of value proposition by various brands and industries as a result of the rapid consumption of online information. There is no space to let them guess what to do next. The surroundings of your blog provide ample scope for you to generate leads by providing value to your users. If you’re starting to think hard about the opportunities you have to increase conversion on your blog, this is just the right place. 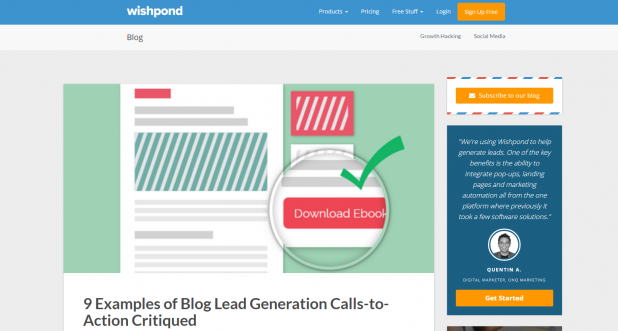 This post will show some of the critical examples of blogs that have rightly placed their lead generation assets in front of the visitors. A testimonial from one of your satisfied customers or influencers could be a great way to set up the expectations for your blog visitors before they hit the call-to-action. Wishpond has set the right chord by providing a testimonial before asking the visitors to get started with their marketing software. Even if your blog or article has been mentioned by an influencer, you still need to promote it yourself. This could prove to be a lead booster for all those who are browsing for some interesting topics. Promoting exclusive content between your blog listings could help generate more leads if it is placed with some striking visuals and thought-provoking content. 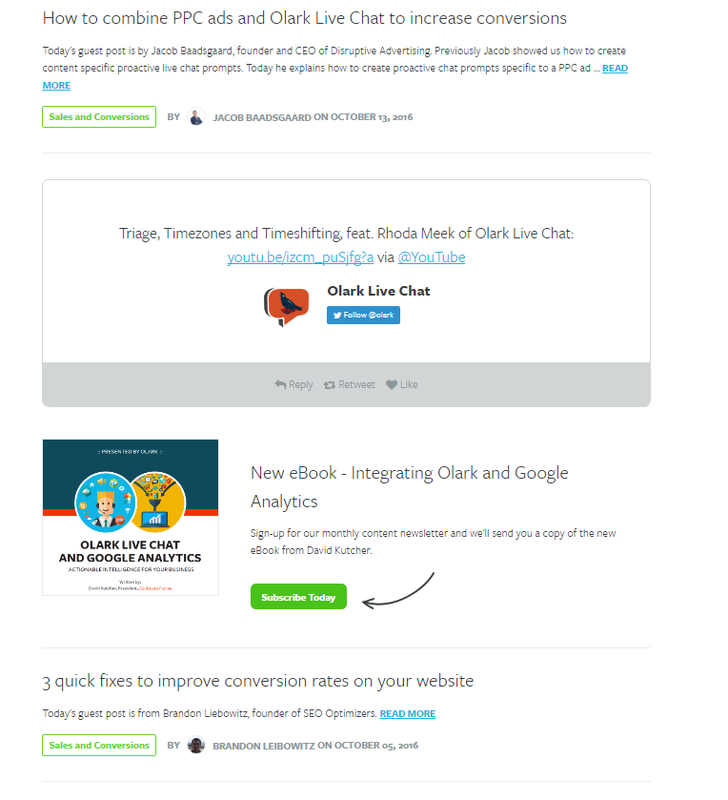 Olark has given a fine example by offering a new eBook in return for a subscription. This is a great way to do some promotion: an innovative box that includes the “Follow” button, tweet, and the engagement buttons from Twitter to increase the engagement on the Twitter account of an in-house member. Businesses try to lure their prospects with enticing and time-based offers. An interesting article could be promoted with a timer which leads to fear of loss and curiosity, in turn leading to quick lead generation. Optin Monster has an offer on its header with a timer that generates a sense of urgency to trigger more registrations from its blog visitors. You could generate leads right from your article if you can convince blog visitors to give their information. In this case, full access of the article is only provided if the visitor wants to share their e-mail address or any other information. In the example given below, Inman asks its visitors to provide their e-mail addresses in order to read the entire article for free. It doesn’t enforce this rule on the visitors, however, and also gives the option to read the article without providing the e-mail address. Navigation bars are something that should be included on all blog pages, enabling customers to browse around the website if they want to know more about your business after reading the article. What if you put your lead generation aspirations right near the navigation? 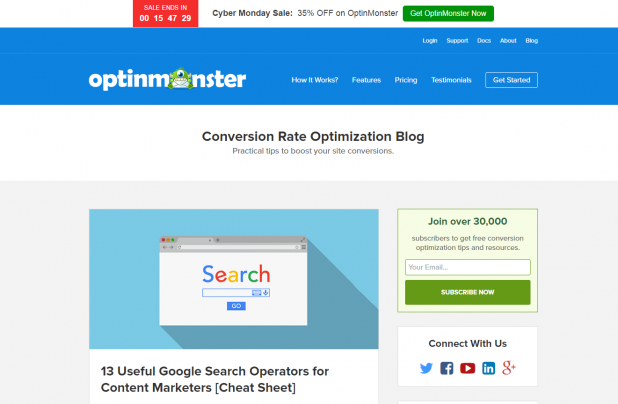 On Neil Patel’s blog, you will find a “Get More Customers” button right near the navigation on the sticky header. The contrasting color of the CTA plays a key role in garnering attention. Let the visitors decide what level of information they need. When there are various levels of information available for your prospects, they will feel more comfortable and confident that they will find the kind of content that is tailored for their needs. Jon Loomer’s webinar promotion is done along the same lines, providing personalized calls-to-action for the visitors based on their level of awareness. Jon Loomer again has played the game right by providing podcasts directly from the sidebar of his blogs. However, we suggest that having an e-mail prior to the start of the podcast would be a great lead generation technique. 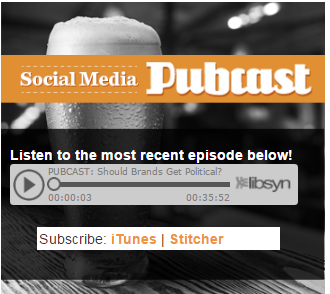 The engagement on your blog page increases considerably as the visitor stays on your page to listen to the podcast. Relevant pop-ups could be timed in order to attract visitors’ attention while they are consuming content. However, this should be done in a subtle manner so that it doesn’t disturb the overall user experience. On HubSpot’s blog on the formula for writing a blog post, as soon as readers reach the first step, they find a relevant timed pop-up that attracts the eye. Visitors are later directed to a page where they could access the offer in return for their information. Sometimes a valuable post could be so long that not all users would be able to consume it at the first go. These visitors could enjoy the benefits of a blog summary. 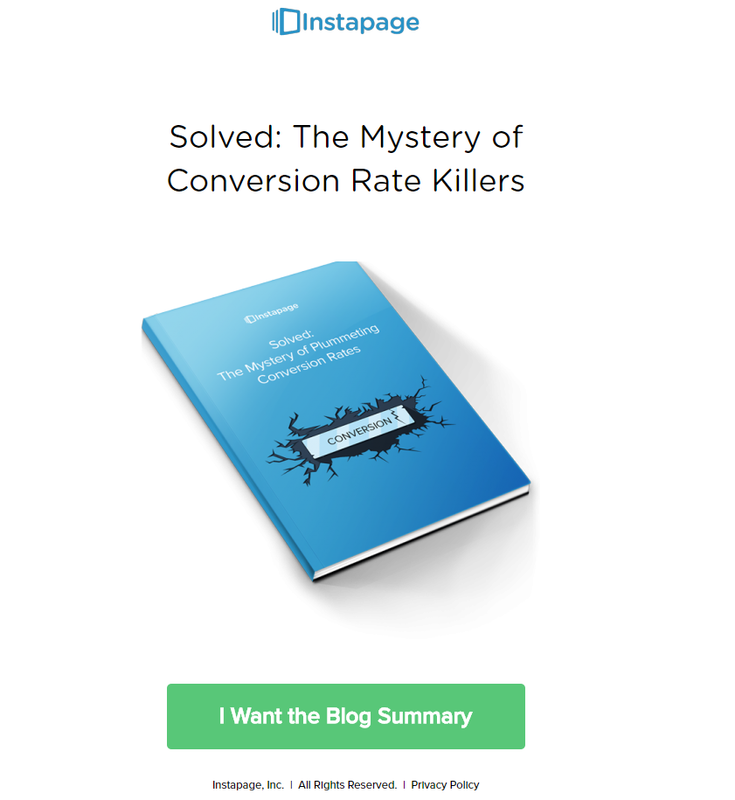 Instapage had published an article called “Solved: The Mystery Of Conversion Rate Killers” for which it also created a summary that was promoted in the blog post itself as given below. 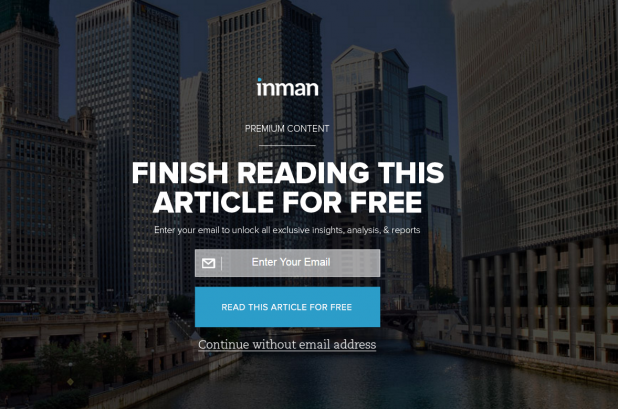 With this call-to-action, users could download the summary by giving their e-mail address. A sales funnel filled with leads is a great way to validate that your marketing efforts are delivering value to your prospects. When lead generation is done successfully, everyone benefits. The pressure on marketers is to strike a healthy balance between lead generation and user experience. We all know how important lead generation is; the tricky part is to come up with fresh and effective ideas to generate them. What are the effective lead generation ideas that you have noticed lately? Let us know in the comments. Dev is the head of marketing at HubMonks, a HubSpot content optimization system (COS) partner for major inbound marketing agencies and brands. Dev utilizes and swears by the power of the HubSpot inbound marketing methodology. He loves to share valuable insights on HubSpot’s marketing software, content optimization system (COS) and the best practices to set up successful inbound marketing campaigns. Feel free to contact him on his Facebook and Twitter.